Some people are confused as to whether yoga postures and menstruation conflict. Generally, the answer is no. Women can practice many different yoga poses during their cycles, but some may opt to avoid certain asanas during active menstruation. Every yoga posture has detailed contraindications. A contraindication is a medical term used when a condition speaks against performing a certain action or receiving treatment. In yoga, contraindications are necessary to encourage practitioners to follow proper form, avoid injury, and respect their bodies when certain challenges are present. An individual's yoga practice is so unique that it's hard to get all experts of the myriad yoga styles to agree to every caution or contraindication of a posture. For example, some instructors may advise students with carpel tunnel syndrome not to do Downward Facing Dog Pose or Plank Pose because of the strain on the wrist. However, some of these students might not have any problems with the posture if they rest their palms on folded towels or rubber balls cut in half. Others might still feel pain even if they use these modifications. Still others with carpel tunnel may never have any issues at all with weight-bearing postures. Some women are completely wiped out during their periods, while for others, those days are no different. There are even a few rare birds who receive an energy boost during their cycle. These factors, along with menstrual flow, pain, mental clarity, and mood mean there's simply not an easy way to say "all women" this or "all women" that. So, it's wise to learn more about the contraindications of certain poses and pay attention to how your body reacts throughout your entire cycle. Start by keeping a chart of your cycle and your yoga routine. If you can perform the same yoga routine for at least three days each week, you'll work through the first day of your cycle, the menstrual period, ovulation, and premenstrual days. Record the yoga postures, general feelings of fatigue or vitality, and how long you hold each posture, or the energy of your flow sequence. This record of events will help you learn more about how your body responds to exertion at key times during your cycle. Then, you can make adjustments as necessary. The major point of contention regarding yoga postures and menstruation involves inverted poses. Also known as inversions, these postures include backbends and poses with inverted legs, as well as abdominal-supported asanas. These postures invert the uterus and contract the abdominals, interrupting the natural downward flow. Some instructors suggest that if you choose do any of these poses, maybe do them only half the time, either in duration or in alternating throughout your session, until you realize the full effects. Other instructors stress that you avoid poses like these until your cycle is complete. It might be helpful to talk about performing certain yoga poses during menstruation with the yoga instructor of the style you prefer most. He or she should be able to get you more information and if you have concerns, work up a modified sequence to use during your cycle. Instructor Barbara Benagh of the Yoga Studio in Boston talks about the various pro and con theories. Instructor Geeta S. Iyengar, daughter of B.K.S. Iyengar, explains in detail the rationale for doing poses that do not obstruct menstrual flow. 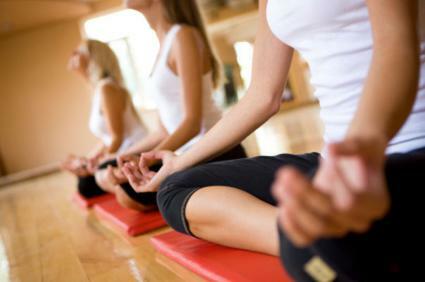 Some practitioners of Bikram Yoga suggest performing that style during menstruation.